Is it criminal prosecution or political persecution of Rastafarian culture? Jodie and Calvin with their daughter Tracy, in happier times. 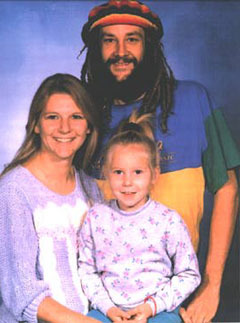 Jodie Israel was indicted along with her Rastafarian husband, Calvin Treiber, and 24 others for an alleged 10-year marijuana conspiracy in Billings, Montana. Jodie and Calvin are first-time, non-violent offenders. The FBI called its investigation "Operation Reggae North," since most of the defendants were Rastafarians. Jodie was charged with possession of less than two ounces of marijuana, plus an alleged sale of four ounces (of which there was no evidence), money laundering, and conspiracy to sell larger amounts of marijuana. They believe their case to be one of political harassment and selective prosecution, as it is aimed at the distinctive cultural group - Rastafarians, who believe that smoking "ganjah" is a religious sacrament which brings them close to God. Meanwhile their four children, who range in age from 12 years down to 3 1/2, have been virtually "orphaned" by the government, since their mother and their father are now locked away from them, serving long, mandatory minimum prison sentences. 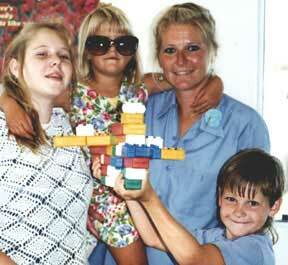 Lower photo: Jodie with three of her children, Tracy, Laura and Richard. Rastafarianism is a way of life based on the Bible and traditions of ancient Ethiopia. Among its customs are the wearing of dreadlocks (a distinctive hair style) and belief that ganjah (cannabis) is a holy herb to be used sacramentally to honor the creator God, "Jah." The group's name is derived from the name of the last Ethiopian emperor, Ras Tafari -- also known as Haile Selassie, who was the church's spiritual leader. At one point Congress passed a special bill, the Religious Freedom Restoration Act, to protect Native Americans who use Peyote as a religious sacrament from Drug War persecution. It was hoped that this protection would therefore be extended to protect the Rasta use of Cannabis (Ganjah). However, the US Supreme Court struck down the RFRA as being an unconstitutional expansion of Congressional authority, because the First Amendment already protects religious freedom . . . in theory at least. The religious use defense was then denied to the defendants on the basis that personal possession or consumption for religious purposes might be protected, but distribution is not. That decision left unresolved the question of how a person can legally receive a sacrament without someone else providing it to them; but that type of contradiction is typical of drug penalties in America today.